Every year people bring to WildCare’s Wildlife Hospital a dozen or more Red-eared Sliders, the most commonly kept pet turtle in the world. These little reptiles were introduced to California, although they occur naturally in other parts of the United States. They are transferred from WildCare to Marin Humane, whose adoption program aims to find them new homes. Why do they come to WildCare? Because people find them injured in the wild! Generations of people, deciding they no longer want their Red-eared Slider as a pet, assume the best place for him or her is in a pool or pond out in nature. Other people buy Red-eared Sliders for their outdoor ponds, and the turtles escape. But these non-native turtles don’t belong in the ponds and waterways of the Bay Area. In fact, they take over the nesting and basking spots, and eat the foods needed by the native Western Pond Turtle, California’s only fresh-water turtle species. The California Department of Fish and Wildlife lists the Western Pond Turtle as a species of special concern. WildCare, Marin Humane, Marin Municipal Water District (MMWD) and the National Park Service (NPS) want to remind everyone that wild animals don’t make good pets, and pets should never be dumped in the wild. “Land managers such as MMWD and the National Park Service are trying to improve their existing Western Pond Turtle populations through habitat restoration and reintroduction projects. We want these efforts to succeed. 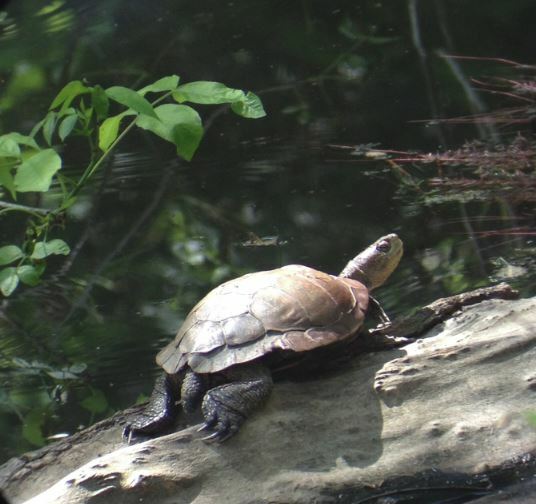 Release of introduced turtles can hamper these efforts,” says Darren Fong, Aquatic Ecologist with the National Park Service. People also dump unwanted pet cats and pet rabbits into state and national parks, with tragic results for both abandoned pets and for wildlife. What can you do to help? First, never dump (abandon) a pet into the wild. Marin Humane can help you try to rehome your pet and if you’re not successful, it will accept him or her as a surrender. Abandoning an unwanted pet in the wild is cruel and too often results in its death from starvation or predation. Domestic, exotic and non-native animals that survive being dumped become problematic for native species and disrupt valuable habitat and other resources. Second, consider realistically your desired pet. Can you commit to having a pet turtle, knowing that turtles can live for 20 – 40 years? This means the pet you get for your preschooler may still need care long after your child graduates from college! Turtles can make good pets but you should know what the commitment is. Consider carefully what type of pet is the best choice for your family including the animal’s temperament, lifespan and specialized veterinary care needs. Third, don’t purchase non-native turtles for outdoor ponds. 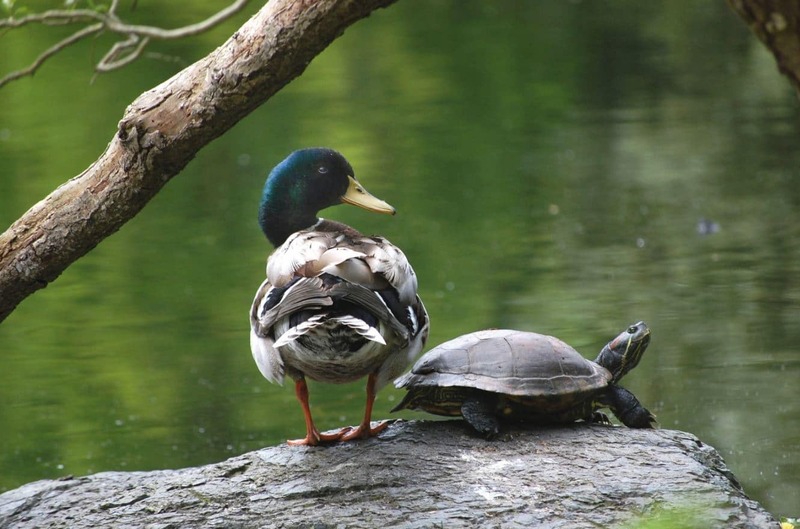 If the turtles escape your pond, they end up in the territory of wild animals with which they compete. Fourth, always consider adoption first! Don’t buy an animal like a Red-eared Slider from a pet store or other source. Rescued and surrendered animals in shelters and with rescue groups desperately need homes. You can change an animal’s life by opening your home and your heart to a rescued or surrendered pet. Remember also to keep pets as pets and let wild animals stay wild. Fifth, know your resources! WildCare’s Wildlife Hospital is ready to help injured and orphaned wild animals, and Marin Humane is ready to take in domestic or exotic pets that you can no longer care for with the goal of finding them new forever homes.